Best XC country tire I have used. I am a High School MTB coach and use the MORSA as a front tire. Had one for 1.5 yr and it was very sure on corners and rough terrain, never ever flatted (I run tubeless) and loved the handling. It was also quite fast for a knobby tread. Just bought another as the surface rubber was finally starting to wear. It is sold as a donwhill tire but I love it as a XC tread. There are cheaper treads but none I like better. Definitely recommend this tire! Fast rolling, excellent cornering tire despite the weight in 29. Use them primarily for summer since not great on wet. Loose over hard ideal. 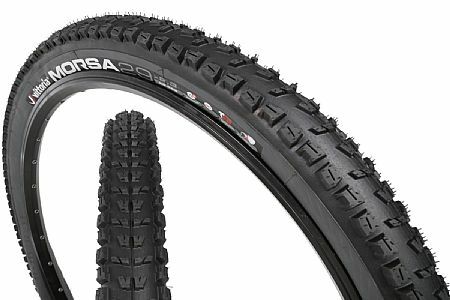 Stout sidewall but will tear fairly easily on top of tread and at tire bead, so use caution when blasting thru the rock. Solid Trail tires that grip well. Would use a different tire for chunkier trails as I did experience a flat on such.